WOW jQuery Slider is light (6kb gzipped), loads fast, utilizes hardware-accelerated animations. It is successfully used and tested on millions pages (yes, millions), so we can say for sure that it's virtually bug-free. You don't waste your time for coding, learning yet another API, testing and photoshopping. The drag-n-drop maker generates the slider automatically with the export as HTML page or Joomla/Wordpress plugin.And with visual Insert-to-Page Wizard you won't need to touch a single line of code to embed it in your page. Huge collection of beautiful skins and breath-taking effects is included and ready to go. Select and apply them in a single click. 1. Drop the images you want to add as slides. 2. Choose skin, effects, options. 3. Save slider as a stand-alone page, Wordpress plugin, Joomla module; embed in page with Insert-to-Page Wizard; publish to server via built-in FTP client. Every slideshow parameter can be easily customized to fit your web site design and your needs. 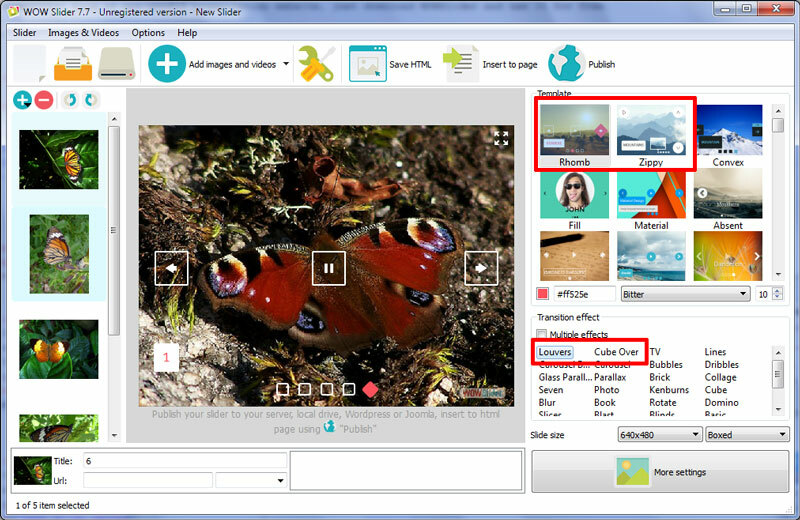 Enjoy features like: navigation control (with thumbnails, prev/next and stop/play buttons, bullets, filmstrip), auto-play, loop, random order, text descriptions, hide/show controls or stop on mouseover, image and thumbnail size, crop mode, slide delay, transition speed, watermark and much more! Most jquery sliders put all supported features in one bloated script. WOW Slider generates the engine script depending on setting you chose, so the final code is compact and has the required functionality only. For example the slider created with default settings is only 6Kb! With the growing trend of mobiles it is important that your website be accessible on all devices. WOW jQuery Slider includes the support for touch screen gestures to ensure that your visitors receive a smooth, native-like experience. WOW Responsive Slider is brilliantly responsive with any template, effect, options you choose. No matter what device people access your site from, the slider will look consistently perfect. Manage all parameters of your slider using a live preview area. See exactly how it will look before you publish. Enjoy easy and fun customization "on-the-fly"
Not a coding guru? Don't know what is an HTML code? Just run Insert-to-Page Wizard, open a page, and click a place where you want the slideshow to appear. WOW jQuery Slider takes care of the rest. Truly NO coding experience! WOW jQuery Slider runs perfectly on all old and new browsers, including IE6+, Firefox, Opera, Safari, Chrome on PC, Mac, iOs and Android. It has a well-structured and clear HTML code, readable by any search-engine spiders and text browsers. With theme collection, you are not stuck with only one look. 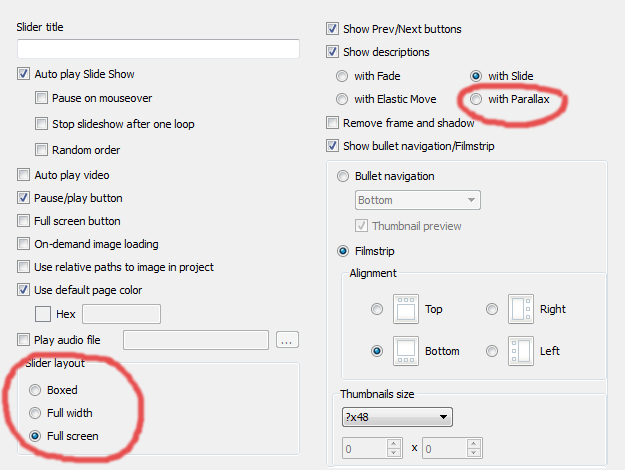 Pre-designed templates help your sliders look professional from the start. 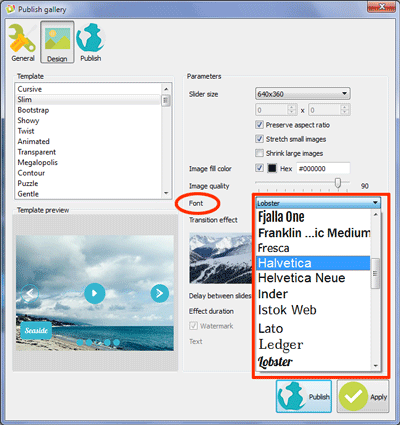 The controls, fonts, colors, frames and backgrounds in each template are perfectly coordinated. Just drop photos or images and add your own words. Use over 25 stunning transitions and effects for images and text that will affect your visitors in a big way. Keep your customers' attention focused on your website. WOW jQuery Slider comes with Joomla and Wordpress slider plugin export so publishing your slideshow to your Wordpress or Joomla site was never as easy as this. In contrast to boxed layout, full width option allows you to set your slider to span the whole width of the browser to make your images stand out. Online video and Youtube particularly is now more popular than cable television. 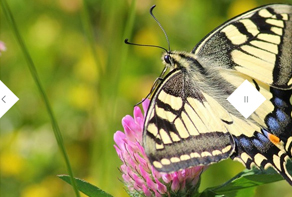 WOW jQuery Slider provides a support for YouTube and Vimeo that allow you to liven up your slides by supplementing the regular images. Imagine you have a slideshow with 128 images. If to put all pictures to the plain HTML code it will dramatically slow down the page loading and performance. For this case WOWSlider has the "On-Demand Loading" option also known as "lazy loading" that loads only images that enter or are about to enter the viewport. It doesn’t matter what is your native language, the WOW jQuery Slideshow app interface is already translated to 38 languages, from Africans to Vietnam! This greatly benefits users - who don't know English good enough - to quickly and efficiently start creating html slideshows. 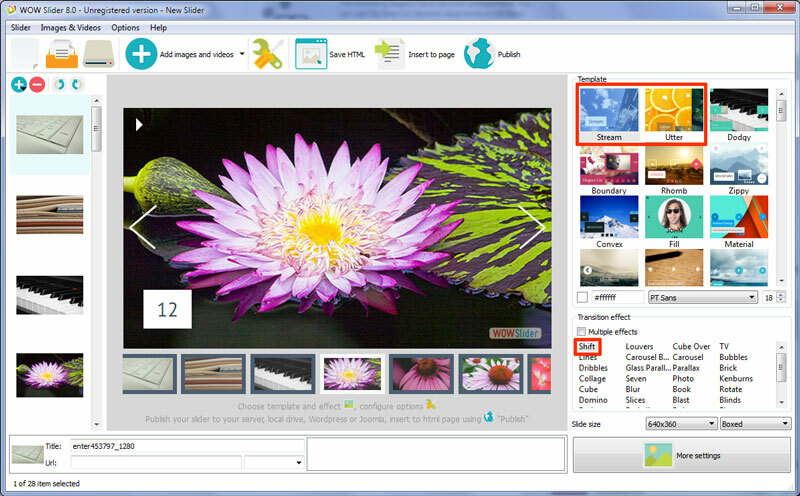 You can easily add photos from Flickr, Picasa, Photobucket to jQuery slider. Just paste the URL of photostream, photoset, album or single photo and define the number of imported images! 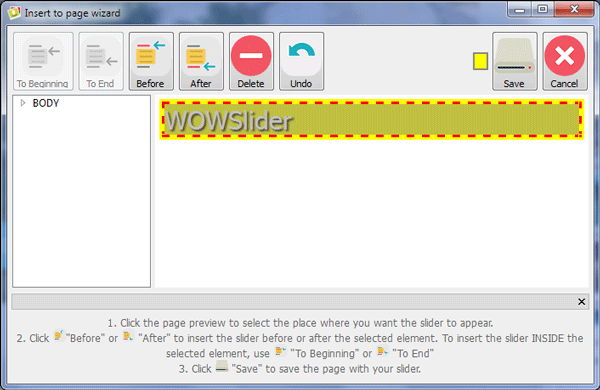 If you work cross-platform, on PC and Mac machines you can seamlessly set up and run WOW Slider on both Windows and Mac OS and use the same interface, features, and project files. Sharing your content on Facebook is getting more and more popular. 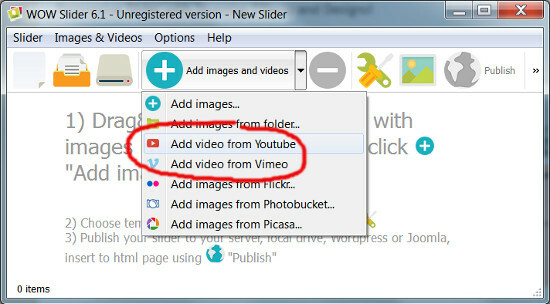 Right from the toolbar, click Share and the slider is there. Turn your slideshow into a worldwide event. Built-in FTP client lets you instantly and securely send your jQuery slideshow files directly to your server, without having to use the separate FTP software. The slider is built using plain HTML5, making it easy for search engines to efficiently crawl the site, while still looking really cool. This gives you the ability to not only please the search engines from sites like Google, but your site will be pleasing to customers as well, all at the same time. Different images have the different size, resolution, orientation. 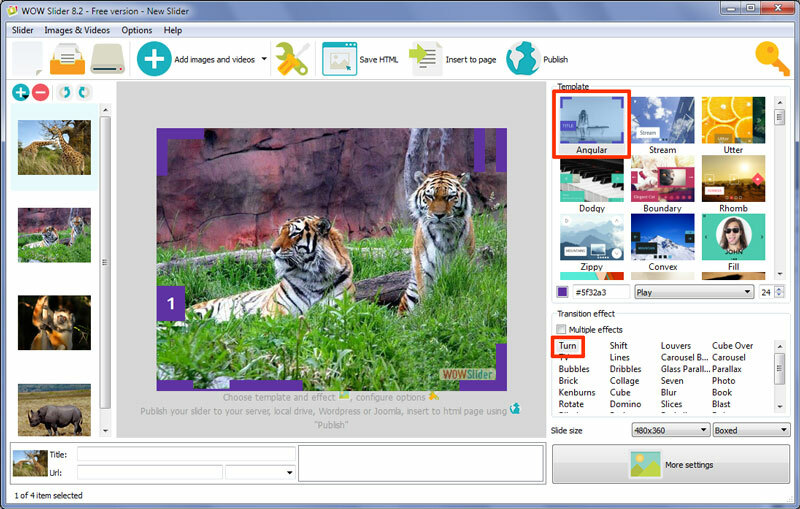 With WOWSlider you'll not need several photo editors to get your pictures ready for slider. WOW jQuery Slider creates perfectly proportioned slide images specifically tailored around your size/crop settings. Images and text alone are often not enough to engage and capture the attention of your audience. Easily add pace and dynamism to your slider by including audio soundtrack. WOW jQuery Slider is free for non-commercial or testing purposes. If you want to set the WOWSlider on a university site, non-commercial blog or simply want to try to see if it fits your needs, just download the full-functional free version and use it for free. For troubleshooting, feature requests, and general help, contact Customer Support at . Make sure to include details on your browser, operating system, WOW jQuery Slideshow version, link to your page. In most cases you'll get a reply within 1 business day. Please check our FAQ and Tutorials first to see if your question has already been answered. WOW jQuery Slideshow creates not only fantastic looking sliders but ones that are optimized for performance, accessibility, and built with all the latest features and functionality. WOW jQuery Slideshow allows you with the simple click of the mouse to make an endless amount of adjustments to your jquery slider. Responsive slider with touch/swipe support? 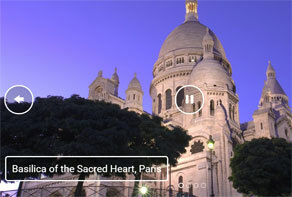 Full-width slider with thumbnail filmstrip and play/pause control? 3D effects and text descriptions? No problem! Even better, you have 50+ completely unique designs, 32 transitions to choose from and hundred of live demos that illustrate what you can achieve with WOW jQuery Slideshow. 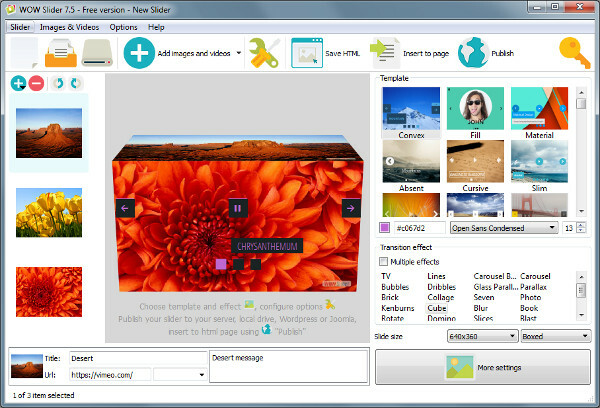 WOWSlider is free for non-commercial use. If you want to use WOWSlider on a school site, your non-commercial blog or non-profit organization website, just download WOWSlider and use it for free. A license fee is required for commercial use. For more info about commercial licenses , please click here. * Brand-new GUI - New right templates/effects panel and Live Preview window. See exactly how the slider will look "on-fly"
* Support for .png image files with preserving transparency. Please see our demo with transparent images. To preserve image transparency, you should disable "Image fill color" option at the Gallery->Properties->Images tab. * Wordpress plugin update: support for RTL mode and multi-sites mode; improved compatibility of new transition effects. * Improved templates: Metro, Balance. 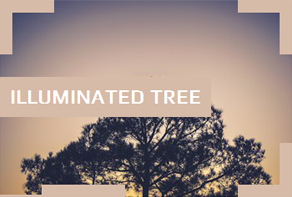 * Improved templates: Plastic, Cloud and Calm. * Single-line iframe embed code. When you "publish to folder", the app additionally creates iframe_index.html containing the Single-line iframe code to embed to your page. * "stopOn" parameter - defines the number of slide to stop on. * Also you can export Joomla slideshow module. * Picassa support. Add Picassa album or a single photo to your slider gallery.